It seemed like a simple, straightforward publication request: please write a 1,000 word biography about Percy LeBaron Spencer, the inventor of the microwave oven. I figured, okay, years ago I conducted some research about his professional work for our past exhibition Invention at Play, so this project should be quick. However, confirming his personal biographical details proved to be more challenging and nuanced than anticipated, providing an interesting example of the historical research process. I like to think of it as something akin to a treasure hunt. I was given a quest: find, fact check, and synthesize biographical information about a known 20th century inventor who worked at the Raytheon Company and his famous invention. I had a few markers, like Xs on a map, about where to start looking for clues, including secondary sources on my library shelf and the Raytheon Company history website. And, more important, I had access to primary sources via reputable online research tools and databases. So I started to dig into the available material and found some interesting discrepancies among published accounts of Spencer’s life. Those discrepancies led me down a “rabbit warren” of biographical research that I thought might be fun to share. I knew this much: Percy Spencer was born in Howland, Maine, and died in Newton, Massachusetts. However, some biographies provide an incorrect birthdate of July 19, 1894, and/or an incorrect death date of September 8, 1970. I confirmed the facts by combing through publicly available government sources, including official birth, marriage, and death records, military registration cards, the U.S. Federal Census, and other searchable records online at AncestryLibrary.com, in association with the National Archives and Records Administration. 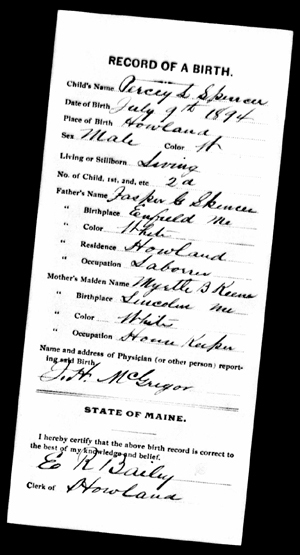 According to the Maine State Archives’ Maine Birth Records, 1621-1922, he was born July 9, 1894, to Jasper G. Spencer and Myrtle B. Keene Spencer. Also, according to the State of Massachusetts’ Massachusetts Death Index, 1970-2003, Spencer died on September 7, 1970 (death certificate #037717). However, his gravestone at the Calvary Cemetery in Waltham, Mass. incorrectly reads September 8, certainly adding to the confusion. Spencer had one older brother, John Alby (“Al”), who was born in Enfield, Maine on May 20, 1892 (some sources list the wrong birthdate for him, too). Sadly, their father died in 1896, and their mother soon sent the two young boys to be raised separately by other family members. Unfortunately, Percy Spencer’s uncle John, his “second father,” then died when Spencer was 7 years old. So by age 12, with only an elementary school education under his belt, Spencer began working in a local mill to help support his widowed aunt Minnie. In his teens he learned electrical work on the job and began his lifelong habit of self-education. Now came the next mystery: at what age did Spencer join the military? I read that Spencer enlisted in the U.S. Navy around 1912 and might have served in World War I, but couldn’t find confirmation. So I went directly to the Federal government, contacting the Military Personnel Records section of the National Personnel Records Center in St. Louis, Missouri. I mailed in the Standard Form 180 to request Spencer’s military records, and a few weeks later photocopies arrived in a government-issue manila envelope. His official file showed that Spencer did indeed enlist in the U.S. Navy in July 1912, serving on the USS Dixie, but he was given a medical discharge after less than two years due to a chronic ear disease. As a side note, I was intrigued to find a handwritten letter in the files from his mother Myrtle (now Mrs. Kenney), dated June 5, 1913, asking the Secretary of the Navy to discharge her son because “on account of illness [I] am no longer able to [work] and need him very much. Now please do your utmost and oblige the broken hearted mother of Perce [sic] L Spencer.” A short, typed reply said Spencer could directly “apply to his commanding officer for the purchase of his discharge.” No further relevant correspondence is in the files, and his mother fades into the background once more. Relatively soon after his naval service ended, Spencer took a job at the Wireless Specialty Apparatus Company in Boston. I know this because his employer is listed on his 1917-18 military registration card. Again, I found an interesting mistake: the clerk wrote in the correct birth month and day on Spencer’s form but the wrong birth year, inserting that of his brother who registered the same day. (I found copies of both registration cards, with matching handwriting, on AncestryLibrary.com). At that point they were their mid-20s, single, living together in Revere, MA, and working as “radio electricians” at the same place. Sometime between 1918 and 1922 Spencer married Louise Larsen, and they had three sons, John, James, and George. Widowed in 1956, Spencer married Lillian Ottenheimer four years later. Spencer’s professional biography is more straightforward than his personal details thanks to greater available documentation about the Raytheon Company and his career there starting in 1925. 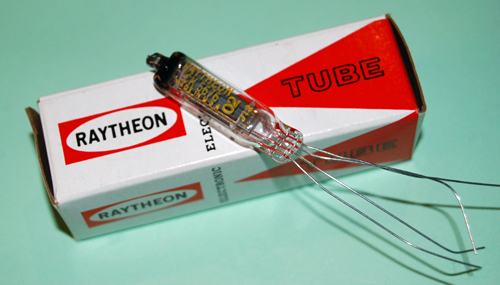 Again, Spencer followed his brother; an inventor himself (known for the Spencer Thermostat), Al was already on Raytheon’s staff. During the mid-1920s through mid-1940s, Spencer worked on a number of important projects related to radio and radar systems, eventually earning the Distinguished Public Service Award from the U.S. Navy for his important magnetron research during World War II. Improving upon a British version, Spencer had redesigned the magnetron—an electronic tube that generates high-frequency radio waves—so it could be mass manufactured more quickly to power essential radar equipment for the Allied war effort. In addition, Spencer invented subminiature tubes that were mass manufactured for proximity fuses, or detonators, for artillery shells. Spencer’s most famous work, the discovery of microwave cooking, was an accidental outcome of his magnetron research. As noted in Spencer’s brief Invention at Play profile, in 1945 he was in the lab standing near a magnetron and noticed that a candy bar in his pocket had melted. Out of curiosity, he placed popcorn kernels by the magnetron and they began popping. Next he tried putting an egg in a pot in front of a magnetron and it splattered a colleague. Spencer and other Raytheon staff members began working on developing a magnetron-powered oven for cooking, and Spencer filed his first related patent that year: U.S. Patent 2,495,429 for a “Method of Treating Foodstuffs” (filed Oct. 8, 1945; awarded Jan. 24, 1950). 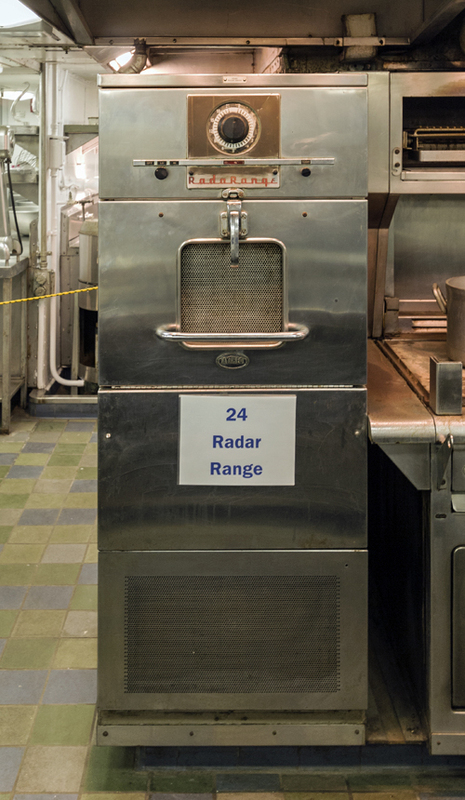 The first commercial microwave ovens, Radaranges, were marketed starting in 1947. The original Radarange stood almost six feet tall, weighed close to 750 pounds, and cost up to $3,000. 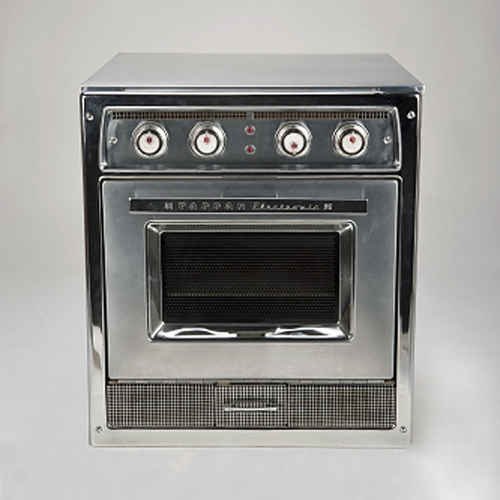 The Tappan Model RL-1 (developed with Raytheon) was the first microwave oven designed for home use, coming on the market in 1955. (The one shown below is currently on display in the National Museum of American History’s popular exhibition Food: Transforming the American Table, 1950-2000.) This model cost $1,295 and was still too bulky to fit in the average kitchen. Thanks to the development in Japan of a smaller, cheaper magnetron, the first truly compact and practical microwave oven was introduced in 1967 by Amana (owned by Raytheon) and cost $495. Yet it still took a couple of decades to become a ubiquitous household appliance. Spencer retired from Raytheon as a senior vice president in 1964 and passed away six years later, unaware the microwave oven would become his signature invention. Some sources say Spencer earned anywhere from 150 to 300 patents, but my search of U.S. Patent and Trademark Office records found 108 patents between 1932 and 1963. 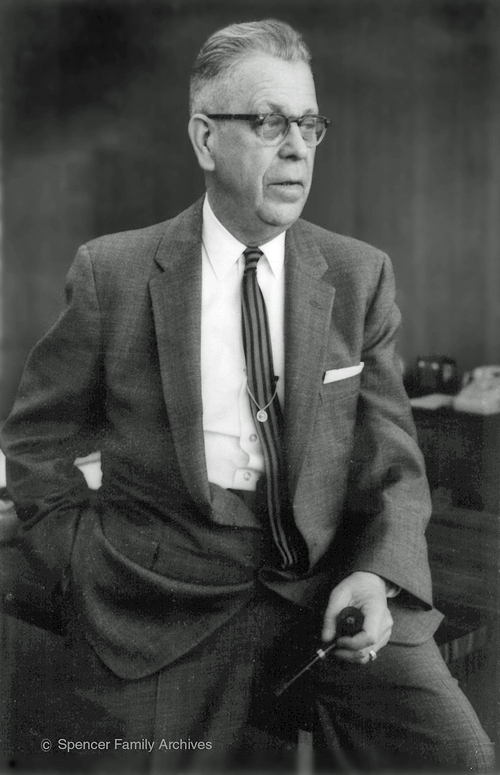 In 1999, Spencer was inducted posthumously into the National Inventors Hall of Fame for U.S. Patent 2,408,235 for a “High Efficiency Magnetron” (filed Dec. 31, 1941; awarded Sept. 24, 1946). Notice that the Hall of Fame has repeated the errors of his incorrect birth and death dates. It just goes to show that mistakes, once they get are published, can become enshrined. Hopefully my research will help others follow an easier path.